It’s not every day you get asked to help launch a humanoid robot. Come to think of it, it’s not every day you get asked to launch one of the most innovative forms of transport ever to have been invented either. But then again, not everyone has an awesome client like Honda. Odd though it may all be, we’ve been back and forth to Brussels, helping Honda arrange the European debuts of both the all-new ASIMO – the world’s most advanced humanoid robot – and the UNI-CUB ?, a personal mobility device that allows you to move in any direction simply by shifting your body weight. 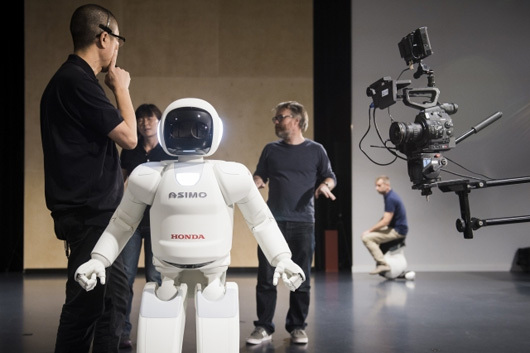 We’ve been involved in all elements of the pan-European launch – from drafting and pulling together the media and briefing materials, to inviting and chaperoning an army of technology, broadcast, lifestyle and automotive journalists to see the examples of Honda Robotics in action for themselves. Coverage is still coming through, but purely from a UK perspective cracking pieces have appeared in the Daily Mail, The Times, BBC News Online (three times – here, here and here), BBC Newsround, The Daily Telegraph (twice), T3 (twice – here and here), Stuff (twice – here and here), Gizmodo, Engadget, New Scientist, MSN UK, Daily Express, Daily Star, Tech Radar (twice – here and here), Pocket-Lint (three times – here, here and here), Car Magazine, The Next Web, International Business Times … with the likes of Wired, Auto Express, Wallpaper and Shortlist to follow. Absolutely cracking work by the team – something we never get tired of saying.